*DURING LENT there is an additional Daily Mass every Friday, 5:30-6:00pm at Wrightstown. DAILY MASS (and Monday Communion Service) - If the Wrightstown School District cancels school because of winter weather, Mass will be cancelled for that day. The Mass intention for that day will be reassigned. WEEKEND MASS - As a general rule, Masses on the weekend won't ever be cancelled. However, if there is extremely bad weather (such as a blizzard and dangerous conditions), for the safety of parishioners Mass may be cancelled. Check the local TV stations for "church closings," as well as the parish website. If the weather is bad enough that you cannot make it to church safely, then please stay home and pray there. 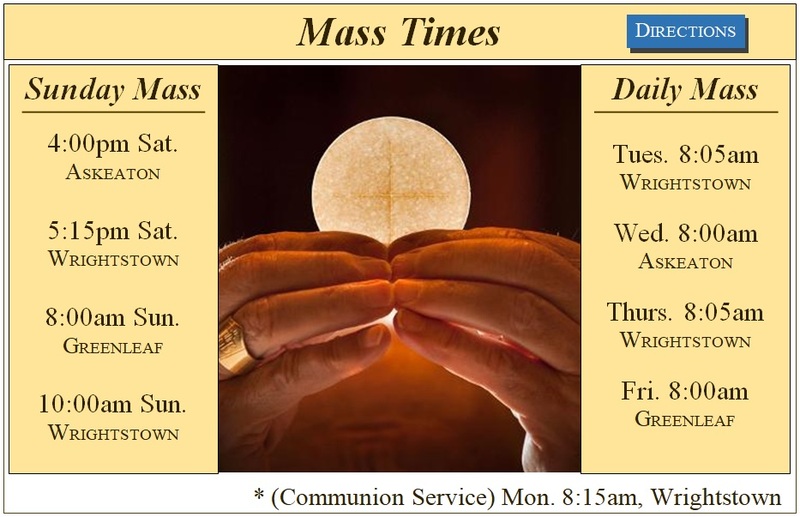 As we know, Sunday is a day of obligation for us Catholics (the Code of Canon Law writes: "On Sundays and other holy days of obligation, the faithful are obliged to participate in the Mass." Canon 1247). However, Church law also states: "if participation in the [Mass] becomes impossible . . . for a grave cause (and winter weather can be a grave cause), it is strongly recommended that the faithful . . . devote themselves to prayer for a suitable time alone, [or] as a family" (Canon 1248.2).